The UK children’s animation Peppa Pig has caused a storm in the media both at home and in China recently with the announcement of Alibaba Pictures and Entertainment One’s co-produced film Peppa Celebrates Chinese New Year (2019), which is scheduled to be released on the first day of the Lunar New Year: 5 February 2019. The chemical spark for this venture came from the fortuitous coincidence that the coming year is the Year of the Pig. While the character of Peppa has been popular with Chinese children and young audiences for some time, a feature film to be released during the New Year holiday is clearly a strategic move. Despite some Chinese audiences expressing their disappointment with the film’s combined animation and live action format, there is little doubt that Peppa Celebrates Chinese New Year will do very well at the box office over the national holiday period. It could even reach a new record in box-office opening sales for British content on Chinese screens. Although currently owned by Canada’s Entertainment One, Peppa Pig’s British origins and identity have been celebrated on a number of occasions as part of modern diplomatic efforts. For instance, the British Embassy in Beijing recently used the story quite effectively by inviting Chinese twins who have been fans of the British cartoon to have tea with the Ambassador, and this will be followed by a visit to the UK. The character has also been used by other organisations such as VisitBritain and the British Council for their campaigns. As part of this ongoing trend, perhaps a copyright campaign could be launched to address a wider issue concerning international trade and foreign policy between China and the UK. Therefore, cultural organisations could use the opportunity provided by the release of Peppa Celebrates Chinese New Year to raise social awareness around copyright issues in China. The campaign could be carried out via a short animation which would feature Peppa Pig and other characters telling a story to encourage Chinese audiences to respect the trademark of the British cartoon and to purchase legally produced merchandise. Furthermore, information about what copyright is and why it is important could also be included, in language that is comprehensible to both adults and children. The short film could then be played as part of the trailers shown before the Peppa film screening. It could also be played in public spaces such as metro stations, bus stations and shopping malls. The realisation of such a campaign would require the voluntary involvement of a number of organisations. However, if we think about its potential long-term effects, the initial outlay of time and effort would be well worth it. To be truly international China’s market needs to be continuously regulated, but as the Chinese government cannot do this alone, external support and inspiration are crucial. If Peppa has the magic to produce a breakthrough like this, why not give her a chance? Peppa Pig’s commercial potential in China extends far beyond the TV series and this new film; its trademark is attached to a great variety of merchandise including books, toys and even a theme park. It is this unique popularity that offers a perfect opportunity for a campaign to be established which could send the right message to young audiences in China whilst preparing them to be fully connected with the modern world order. Hiu Man Chan is a researcher specialising in creative industries collaboration between the UK and China, currently affiliated with Birmingham City University. She is Series Editor of Intellect China Library and a columnist for the UK-Chinese Times. She tweets @H_onfilm. 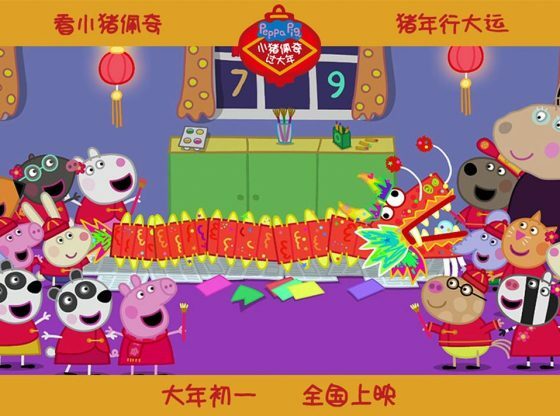 Image Credit: Official press release posters for Peppa Celebrates Chinese New Year. I wonder whether the campaign can feature a special guest appearance by another loveable animal character, Winnie the Pooh?